The Zorns originating from Alsace belongs to one of the oldest noble families in Europe. It can trace its roots back to the noble man Burcard Riplin in 1197. About a century later the family is flourishing and has several coat of arms linking them to various regions and castles in the province of Alsace. The two family lines that have kept their title "Freiherrntitel" are the families: Zorn von Bulach and Zorn von Plobsheim. These titles were approved to the families by France, 6 Aug 1773 (just a few years before the French revolution. It can still today only be speculated about how many of todays Zorn that have their origin in Alsace. Characteristics of the Zorn family coat of arm is the eight folded star on the shield, that each and every coat of arms carries. Below is the Zorn von Bulach family crest in color. 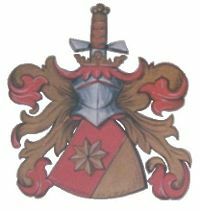 Most of the Zorn family crests are believed to have similar colors.